First Suite in E Flat was one of the first original compositions for band. The repertoire at that time consisted of popular pieces and transcriptions of orchestra works. To distinguish it from a Brass band, the designation Military band was used (i.e., in addition to brass instruments, woodwind and percussion instruments were employed) - what would today be referred to as a Concert Band or Symphonic Band. Gustav Holst, composer, pianist and trombonist, was born on September 21, 1874 in Cheltenham, England and died on may 25, 1934 in London, England. He studied at the Royal College of Music, where he met fellow student Ralph Vaughan Williams (1872-1958), who remained a lifelong friend. Holst was employed as a trombonist with the Cara Rosa Opera Company and the Scottish Symphony (1898 - 1901) before “retiring” to become a full time composer, supplementing his income by teaching at several locations including St. Paul’s Girls School in Hammersmith, from 1905 until his death. Although his most famous work is The Planets, Op. 32 (1914-6), Holst composed a wide variety of works: more than 10 operas - 4 published: Savitri (Op. 25, 1908), The Perfect Fool (Op. 39, 1918-22), At The Boar’s Head (Op. 42, 1924) and The Wandering Scholar (Op. 50, 1929-30); several works for Chorus and Orchestra, including Hymn To Jesus (Op. 37, 1917) and Choral Symphony (Op. 41, 1923-4); many Orchestral works, including A Somerset Rhapsody (Op. 21, No. 2, 1906-7), St. Paul’s Suite (Op. 29, No. 2, 1912-3), Egdon Heath (Op. 47, 1927), Double Violin Concerto (Op. 49, 1929) and Brook Green Suite (1933); a very large number of Choral works; and, of course, works for Band, including 1st Suite in E Flat for Military Band (Op. 28, No. 1, 1909), 2nd Suite in F Minor for Military Band (Op. 28, No. 2, 1911), A Mooreside Suite (for brass band, 1928) and Hammersmith (Op. 52, for military band, 1930). In 1909, when the First Suite in E Flat was composed, there was no standard instrumentation for a Concert Band, so Holst scored the work for 19 instruments with 17 additional “ad lib.” parts (meaning, the piece could be performed without them) but even the original 19 included some instruments which are now obsolete (Db Flute & Piccolo and Bombardons - an early type of tuba). The 1st Movement Chaconne, closely related to the passacaglia, is a continuous variation, usually in triple meter. The 14 note theme played by Euphonium and Tuba at the beginning is the melodic source for the entire work. This theme is repeated 16 times: 6th time as “hits” in the brass; 9th time as an Alto Sax solo; 10th & 11th times inverted (starting on the same note but going down one note, rather that up, etc.). The 2nd Movement Intermezzo (an Intermezzo usually comes between the opening and closing, as does this one). The first 3 notes of the theme from the Chaconne are the source for both the first and the second themes; both themes are combined in the last 18 bars. The 3rd Movement March also uses the first 3 notes of the theme from the Chaconne as the source for both the first theme (the inversion for the March) in the brass and for the second theme (the Trio) in the woodwinds; with the two themes later being combined for 30 bars with the brass playing the woodwinds’ theme and the woodwinds playing the brass’ theme - the opening notes of the first theme of the Intermezzo also appear intermittently. In this arrangement as a Sonata for Alto Saxophone and Piano, as much as possible of the 1st Alto Saxophone band part has been retained and the part has been marked to indicate the original source (Woodwinds, Brass, etc.). 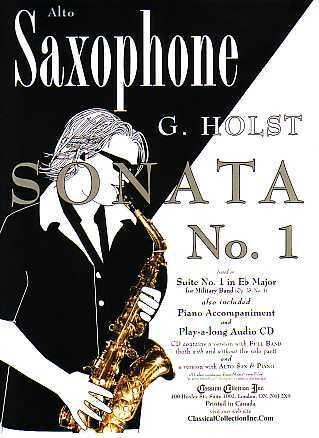 This makes the Sonata ideal for any saxophonist who is studying or performing the First Suite, to better play, understand and, in general, enjoy the wonderful music of the outstanding piece!